Time to start calling strangers? With the memory of being forced to turn back fresh in our minds, we made sure to check with Border Patrol about hiking into Douglas along the fence. We didn’t have high hopes but were pleasantly surprised when Agent Layva assured us that it would be absolutely ok and that he would notify his crew. Thanks BP! We also continued to try to reach out to a reclusive landowner who is at the heart of an ongoing saga surrounding our first 100 miles into up and coming New Mexico. A huge swath of land directly in our path belongs to a conservation organization that is notoriously secretive and protective of their property, the Animas Foundation. Attempting to contact them has led us down a frustrating rabbit hole of false leads and purposefully incorrect contact info. Hmm? Ugh Tenny has already contacted at least 5 different people and finally today she got a representative on the phone who tells us, in no uncertain terms, that we absolutely cannot cross the road running through the Animas Foundation’s property. Great. Now we’ve got to figure out an entirely different route through an area riddled with private property and far, far away from any towns. Luckily for us, Kris is equally fascinated by logistics, and offered to do some research while we’re hiking. He dropped us off back at the wall, but not before detouring to the Lavender Pit, a former copper mine outside Bisbee. It looked like a giant 300 ft chunk had been yanked out of the ground. All that remained was a terrace of multicolored rock: Brecca the yellow, angular gravel cemented together, grey Granite, Pyrite, and red from sulfate minerals that are oxidized. It was shut down in the 1970s and, despite the scar it left, the surrounding informational signs praise the sustainable mining practices used. Right as we pulled up to the fence, we were approached by a border patrol car. And in it...a lady!? At this point we’re up to three female border patrol and counting! Saying goodbye to Kris each morning feels a bit like being ripped away from all that is good in life. We had hoped to figure out a way to have him hike with us, but we can’t deny that the car support has been the best thing for us. We feel guilty but Kris keeps generously assuring us that he’s here to maximize our ability to continue with this project. THANK YOU KRIS/POPS! It’s hard to leave you every morning but it feels so good to get picked up! Thanks for making this section possible. Our conversation today was filled with anxiety and frustration. We have no idea how we’re gonna get through this upcoming section and the stress isn’t exactly bringing out our kindest and most charitable sides. The wall loomed in our periphery making the mood even more ominous. It kept changing between mesh and a heavy green aluminum, like a 3D, geometric puzzle rearranging on cue when someone snapped their fingers. The aluminum sheets are just stacked on top of each other and you wouldn’t need to be a rock climber to scramble up the overlapping sheets like steps. 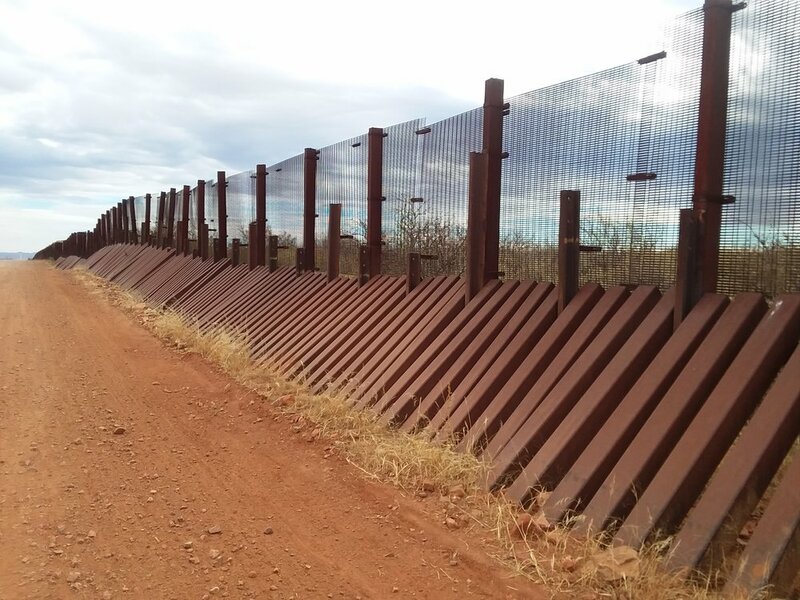 A couple miles further the wall turned into a low barricade, two diagonal posts met, crisscrossed and allowed a horizontal metal post to rest on top. This is called a Normandy fence (a type used in both World Wars). Each variation seemed more questionable than the last. Every mile or so odd handmade signs hung on the wall. Some were in the shape of a castle or a state, South Carolina, Maine, Tennessee. Our only guess was that different organizations were responsible for or associated with different sections of wall? It’s a mystery. Another mystery was the loud helicopter that circled directly above us, only to hover facing the wall for at least five minutes as we passed beneath it. Creepy. What was the helicopter facing? Because it wasn’t us. Throughout the day we spoke to different friendly Border Patrol agents, almost all of whom warned us that this was a particularly busy area and that we should be extra careful. To our untrained eyes, it was completely dead out here. While we were talking to an agent near the edge of Douglas, he told us that someone had just crossed right behind us and we probably hadn’t even noticed. It wasn’t clear if he meant right then or earlier in the day but it was a good reminder that our perspective is limited and we need to be careful not to assign too much truth with a capital T to our personal observations. And the area was fortified for high activity. The openings into all the culverts were barred with rebar so no person could hide inside. There was an awful cage-like structure a short distance from the wall. At the top of the chained in space were large coils of barbed wire, we guessed to prevent people from escaping the space. What is it? Do we want to know. Then we were in Douglas. Despite the fact that it’s clearly seen more prosperous days, the town has a very well-cared for feel. Our waiter bemoaned the loss of the old mom and pop shops that used to line the streets, but took a lot of pride in the beautiful surrounding mountains and the safe and tight-knit community. 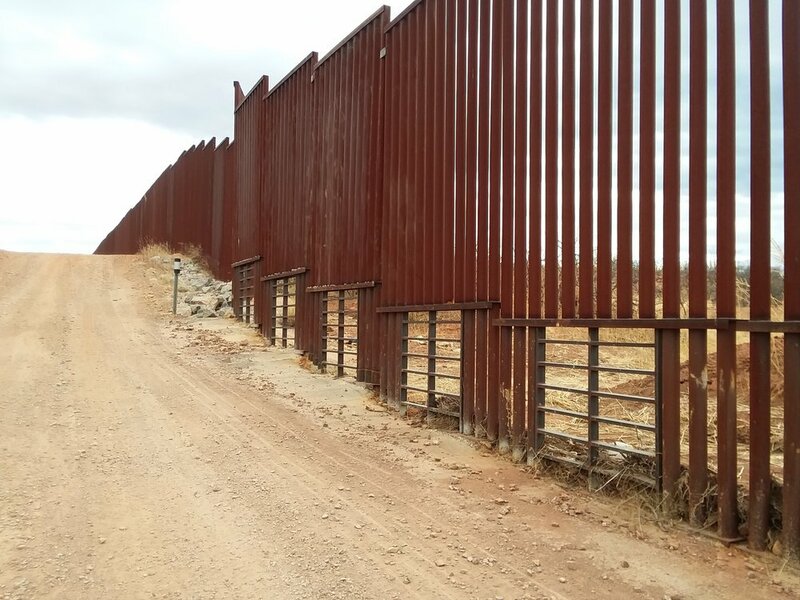 Another woman we spoke to talked about the close relationship with the sister-town of Agua Prieta, Mexico, and how residents spend half their life across the border. We’re happy to have relocated here; Sierra Vista has far more amenities but Douglas has a personality! Including a very special organization which we’ve been in touch with, Frontera De Cristo. The owner, Mark Adams is a wonderful reference if ever you’re in the area! We finished the day at a beautifully-maintained running trail leading out of town and into the mountains. It was sunset and people of all ages were out on the trail, running, walking and biking. Yay for the outdoors!